The Association of Avian Veterinarians is dedicated to advancing and promoting avian medicine, stewardship, and conservation. The Conservation Committee helps to fulfill this mission by providing educational opportunities for our members, supporting conservation research, and serving as a voice for avian veterinarians committed to bird conservation. Continue to produce monthly conservation notes for the AAV newsletter. Establish quarterly updates for conservation committee members. Continue to increase member participation in the Wild Bird Health Grant. Complete white paper and policy statement on the risks of climate change to birds. Each year at the annual conference we coordinate and oversee several conservation-oriented activities, including the Conservation Evening with presentations by speakers with expertise in bird species of regional conservation concern. We have had experts from academia, government departments, and NGOs that span topics including habitat protection, biodiversity loss, behavioral ecology, and wild bird management. Additionally, for the past several years we have coordinated a birding and nature walk during the meeting. These trips get us out of the hotel and allow us to engage in the local birdlife and landscape within a short drive of the meeting location. These events have been heavily attended and are very enjoyable! We also work throughout the year to better define issues of conservation concern for AAV by developing position statements which can influence policy. Topics include lead-based ammunition, outdoor and feral cat impact on wild birds, collision with anthropogenic structures (e.g., wind turbines), and several others current under consideration. The conservation committee also contributes by writing articles for the newsletter and working with allied groups such as the American Bird Conservancy. You can read past newsletter articles on the AAV Conservation Blog. This is updated monthly so check often and feel free to leave a comment! We have also have an interactive Avian Conservation Medicine map using the google map platform that is intended to be a geographically-based compilation of AAV members that are engaged in bird conservation efforts. If this describes you, please click on the link and follow the instructions to “drop” a pin at your location and briefly define your conservation efforts. We hope that this will be a source for AAV members interested in conservation efforts nearby as well as provide a resource to facilitate collaboration. Our Wild Bird Health Fund, which is supported by collaboration with the Research Committee, provides up to $5,000 to support a conservation-oriented research project each year. Committee members review proposals and help select which projects will be awarded funding. If you would like to get more involved in AAV conservation please contact the AAV Conservation Committee Chair. Are you an AAV member engaged in conservation efforts? If this describes you, please submit information about your efforts using the following form. 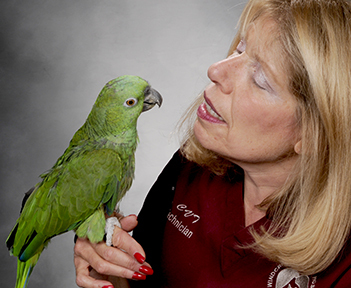 Dr. Fallon is one of the owners of Cheat Lake Animal Hospital in Morgantown, WV, as well as the Conservation Chair and West Virginia State Liaison for the Association of Avian Veterinarians. 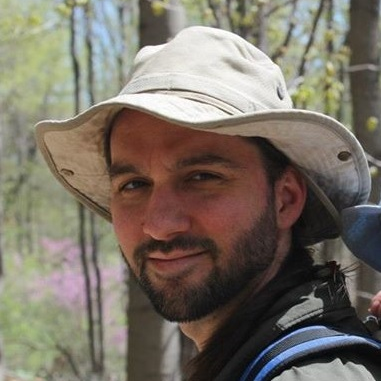 He is also a PhD candidate in Fish & Wildlife Conservation at Virginia Tech. Jesse has provided veterinary care for many species of birds at zoos and wildlife centers as well as for private enthusiasts and falconers. Dr. Becich is 2018 graduate of Tufts Veterinary School, and is currently working in private practice in West Virginia. She continues to work as an international field associate in Ecuador for the National Aviary in Pittsburgh, PA. The aviary is partnering with Bioparque Amaru against wildlife trafficking and for Andean Condor conservation efforts. 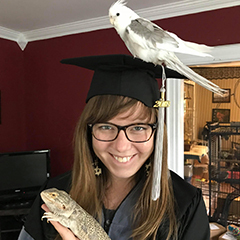 She is most passionate about avian medicine and conservation ecology, but enjoys all aspects of wildlife, exotics, and small animal medicine.